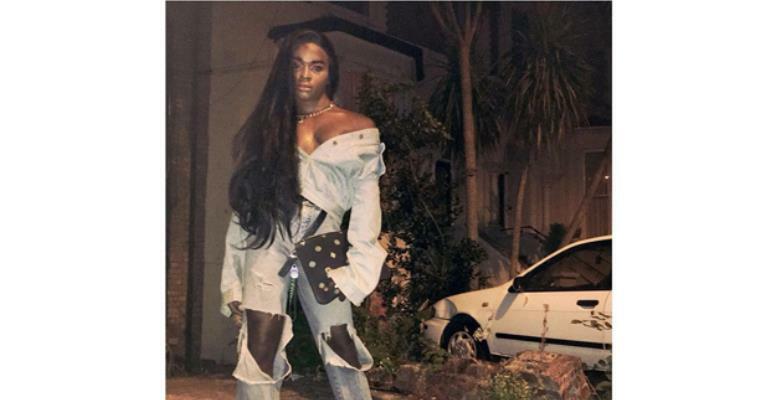 Kyei Darkwah, fashion editor for Gay Times Magazine in the UK and son of ace Ghanaian broadcaster Kwasi Kyei Darkwah (KKD), has released new photos to further embrace his sexuality. In June 2017, Kyei Darkwah disclosed his sexuality to a global digital magazine, intomore.com, saying he is a gay. Kyei, who is also a model and stylist, told the magazine he had a difficult time before coming out about his sexuality. According to him, he used to hide it from his family and adopted a style to be very quiet, obedient and often stay in his room so as he would not be noticed. But he has come of age and doesn’t feel the need to conform to anybody’s standard in terms of sexuality. He has recently shared a number of new photos in addition to his old photos to further embrace his sexuality. “Feeling my witchy fantasy,” he said under one of his posts in July, in which he dressed and posed like a female. Kyei’s sexual declaration made the headlines back in November 2017 in Ghana, where his dad also resides. The subject was discussed across major media platforms, as his revelation brought mixed reactions from Ghanaian public. Most Ghanaians usually kick against homosexuality but KKD stood firmly by his son and congratulated him on his courage to open about his life.